On Dec. 24, 2015, Newton's girlfriend gave birth to the couple's first child, a boy they named Chosen. On the unusual first name, Newton explained that he wanted a name that was both masculine and unique, according to ESPN, and didn't want to name his son after himself. 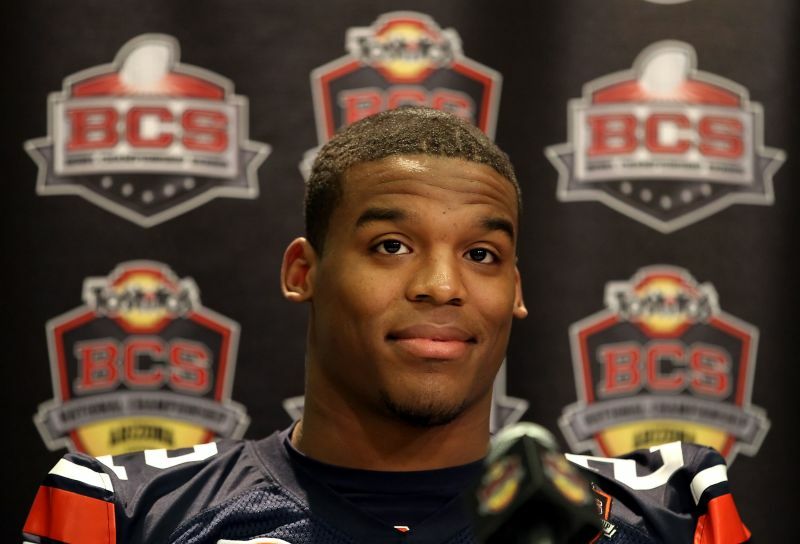 While it's well-known how Newton led Auburn to the 2010 BCS national championship, he also won a national title the year before. In 2009, he helped Blinn College (Tex.) win the NJCAA national championship. Newton was also a member of the 2008 Florida Gators football team that won a national title, but left under dubious circumstances. He transferred after the fall semester rather than face discipline stemming from three instances of academic cheating. Newton has made three Pro Bowl appearances in his first five NFL seasons. This year, he was one of 10 Panthers to earn an invite to Hawaii, the most of any team in the league. He also earned his first All-Pro selection after setting career highs in passing touchdowns (35) and passer rating (99.4). In half a decade, Newton has redefined what it means to be a dual-threat quarterback, making up for his lack of blistering speed with an imposing 6'5", 245-pound frame. No quarterback has more seasons with at least 3,000 passing yards and 500 rushing yards than Newton. Randall Cunningham and Russell Wilson each have reached those marks in the same year three times. Newton also has five seasons with at least 15 passing touchdowns and five rushing touchdowns, also a league record. Two signal callers have accomplished that feat three times: Cunningham and Michael Vick. Newton put up all kinds of gaudy stats in his lone season as a college starter. 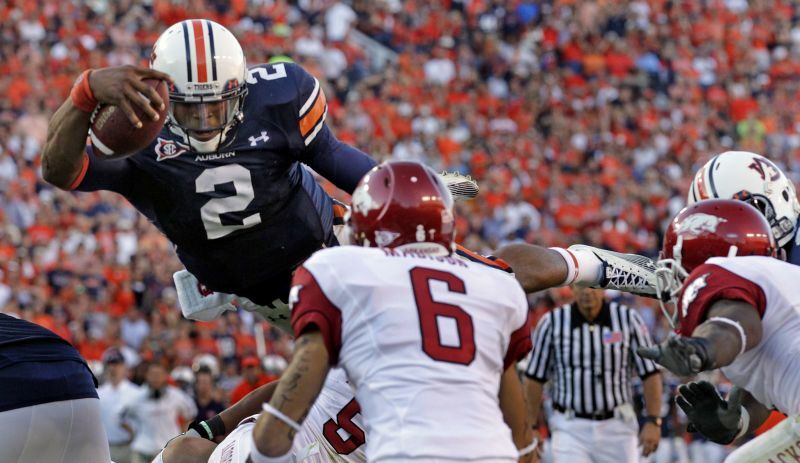 He topped the 100-yard mark in six games in 2010, with five of those performances coming against SEC defenses. His best rushing performance came in a 24-17 win over LSU, when Newton ran for 217 yards on 28 carries. Newton's 10 rushing touchdowns in 2015 were tied for the fourth-most among all players and tops among quarterbacks. Rookie Jameis Winston was second among QBs with six, followed by Kirk Cousins with five. Upon entering the league, Newton wasted no time showing off his skills as a runner. His 14 rushing scores in 2011 set a league record for single-season rushing touchdowns by a quarterback. That number also put him in a tie for fifth all-time among rookies, trailing only Eric Dickerson, Mike Anderson, Clinton Portis and Ickey Woods. Thanks in large part to Newton's stellar play and a lights-out defense, the Panthers became just the fourth team in NFL history to start the regular season 14-0, along with the Dolphins in 1972, Patriots in 2007 and the Colts in 2009. 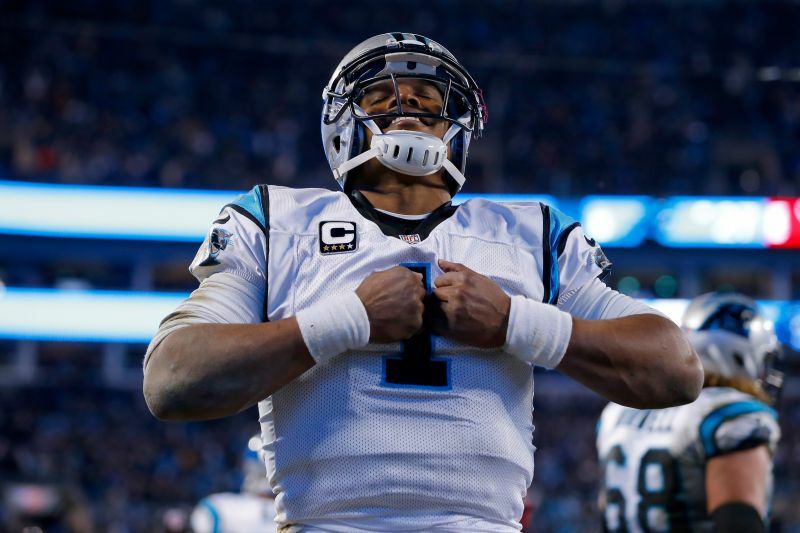 During that 14-0 start, Newton completed 58.8 percent of his passes with 33 touchdowns and 10 interceptions. He also rushed for 580 yards and seven scores, putting himself in firm position to win his first career Most Valuable Player award. In 2010, Newton tied with former Nevada quarterback Colin Kaepernick for third in the NCAA with 20 rushing touchdowns. Newton is one of three players in major college football history to both run and throw for at least 20 touchdowns in the same season, along with Kaepernick and former Florida quarterback Tim Tebow. Newton has topped the 50-yard rushing mark 28 times in 78 career regular season games, the most of any quarterback since 2011. Russell Wilson has the second-highest 50-yard rushing games (17), though he didn't enter the league until 2012 and has played in only 64 regular season games. Newton rushed for a four-yard touchdown late in the second quarter during the Panthers' Week 17 game against the Falcons, making it his 31st game with both a passing and rushing score. That ties him with Hall of Famer Steve Young for the most in NFL history, which is amazing since it took Young 169 games to reach that mark, while Newton did it in just 78. With 21 passing touchdowns and 14 rushing scores in 2011, Newton set an NFL rookie record for total touchdowns, breaking the old mark of 27 set by Charlie Conerly in 1948. Newton had eight games with at least one passing and rushing touchdown in 2011, along with six multi-TD passing games. Newton's 43 rushing touchdowns since 2011 are the third-most among all players during that span, trailing only Marshawn Lynch (51) and Adrian Peterson (45). He's first among quarterbacks, with over three times the amount of Andy Dalton (14), who holds the No. 2 spot. Newton's 2010 season was truly a remarkable year. He threw for 30 touchdowns, ran for 20 and caught a touchdown, giving him 51 total touchdowns on the season. Newton totaled 2,854 pass yards, 1,473 rushing yards and 42 receiving yards, making more than a year's worth of highlight-worthy plays. In the 2010 Heisman Trophy voting, Newton won in a landslide. His 729 first-place votes are the fourth-most since 2000, and he was the third Heisman winner in Auburn history after Pat Sullivan (1971) and Bo Jackson (1985). Newton is one of 20 Heisman Trophy winners to be drafted first overall in the NFL draft. Newton's career-high 741 rushing yards in 2012 also represents the eighth-highest rushing total for any quarterback since the AFL-NFL merger (1970). Three active players rank above him on the list: Michael Vick (three times — 2002, 2004 and 2006), Robert Griffin III (2012) and Russell Wilson (2014). Newton ranked 12th in the country in 2010 with 1,473 rushing yards. That set an all-time SEC record for rushing yards by a quarterback, a mark that was nearly beaten by Johnny Manziel in 2012 with 1,410 rushing yards. In his only season in junior college, Newton threw for 2,833 yards with 22 touchdown passes. He also ran for 633 yards, leading Blinn to its fourth national title in school history. His play made him the No. 1 junior college player in the country and a very sought-after recruit, paving the way for his eventual rise to superstardom. Newton's 3,207 career rushing yards ranks him 18th among all players since 2011 — ahead of running backs like Mark Ingram, C.J. Spiller and teammate Jonathan Stewart. He ranks No. 1 among quarterbacks during that time, rushing for 777 more yards than Russell Wilson. Despite playing just five seasons, Newton ranks 13th all-time among quarterbacks in rushing yards. Few doubted Newton's ability to do damage with his legs when he entered the league in 2011, but some were skeptical of his passing skills. He silenced plenty of critics by becoming the first rookie ever to throw for over 4,000 yards. Newton's record was broken one year later, as Andrew Luck passed for 4,374 yards as a rookie in 2012. A quick look at Carolina's wide receiver depth chart shows some uninspiring names — Ted Ginn Jr., Jerricho Cotchery, Devin Funchess and Corey Brown don't exactly strike fear into the hearts of opposing secondaries. Perhaps the main reason for the Panthers' success in the passing game, aside from strong quarterback play, is tight end Greg Olsen. Olsen was traded to Carolina prior to the 2011 season, the same year Newton was drafted. Since then, the duo have connected for 329 catches, 4,109 yards and 28 touchdowns. Olsen is clearly Newton's favorite target, and the former Miami standout set a career high with 1,104 receiving yards in 2015. Newton's rushing ability is a huge part of his overall value, but his production purely as a passer is nothing to sneeze at. His 18,263 career passing yards are the ninth-most since 2011, and his 117 passing touchdowns rank as the 12th-most. With Peyton Manning seemingly nearing retirement, Newton could emerge as the league's most marketable player. He already has endorsement deals with several companies, including Gatorade, Microsoft Corp., General Motors Co., Under Armour and Beats by Dre. According to Bloomberg, he brings in $11 million annually in sponsorship money. Newton's recent Beats by Dre ad has received plenty of airtime during the 2016 postseason, and he's sure to be a mainstay during commercials for the next decade. The Panthers inked Newton to a five-year, $103.8 million contract in June 2015, with general manager Dave Gettleman saying at the time, "We believe he'll take us to the Promised Land." Now that Newton has the team back in the Super Bowl, Gettleman's words seem prophetic. The deal earns Newton $60 million in guaranteed money and comes out to an average of nearly $21 million per season. Not a bad deal for the one they call SuperCam.